St. Columba’s welcomes you to explore, create, and listen as you travel through four large rooms of artwork. 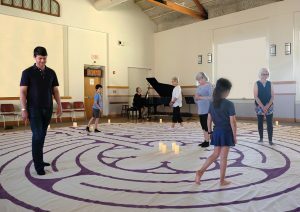 Often described as “a walking meditation” or “a watering hole for the spirit,” St. Columba’s invites all ages to walk a labyrinth while listening to live music. Or you can just sit and savor the music. Children – and the young at heart – can turn their imagination into creation at the Lego Art Center. All will enjoy art from the Red Pear Gallery and other area artists. All ages welcome! 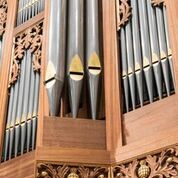 This venue is open from 7-10 p.m.
7-10 p.m. St. Columba’s presents Bach (Almost) All Night as area organists perform works by Johann Sebastian Bach throughout the evening.